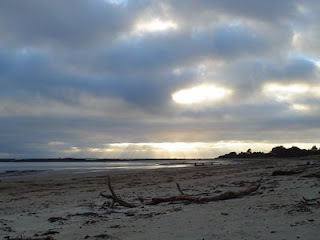 .......53 Buddhas and Me .................My Life Adventures.....: "Tuesday's Quote"
until you leave the shore"
I took this photo of the beach in Wynyard, Tasmania at 6.00am on a cold frosty September morning in 2003. It was extremely peaceful, and serene, pity it didn't last all day. I think I need to start leaving the shore.